Learn the difference between individual and group voicemail options and how to access and manage voicemail for your Shaw Business SmartVoice system. Call *98 from your Polycom handset or mobile/desktop app and enter your passcode. On your Polycom handset, press the message icon (located on top left corner of your handset), then select Message Center. On your Polycom handset, press the home icon, select Messages then select Message Center. For remote access, call 1-855-610-6096, then enter your 10-digit SmartVoice number. Did you know? Group administrators can update voicemail passcodes for all users, but can't see current passcodes. Forgotten passcodes will need to be reset. These steps also apply to resetting group voicemail passcodes. Individual users can update known passcode through the portal, but forgotten passcodes will need to be reset by your business' group administrator. Log in to smartvoice.shawbusiness.ca with your group administrator credentials. Select the user by clicking on their name. Use the Passcode section on the right to manage voicemail PIN (the Password option is for user portal login). Choose your own: Follow passcode rules, enter in your New passcode, enter the passcode once again in the Confirm passcode field, then press Save. System-generated: Select Generate, make a note of your new passcode, then press Save. Log in to smartvoice.shawbusiness.ca with your credentials. Select the Profile/911 Update tab. Under the section Password Reset, enter your current passcode, then either create a new passcode or press the Generate button to create a system-generated passcode. Scroll to the top or bottom of the page and press Save. Call into voicemail; the system will prompt you to change your passcode again, but you can use the same passcode you just created. How do I know I have new messages? Phone makes an audible alert tone when the caller finishes recording his or her message. Status bar message indicating the total number of new messages. Flashing message waiting indicator light located in top-right corner of phone. Stuttering tone when the handset is picked up to make new call. How do I set up voicemail to email on my SmartVoice? Advanced voicemail options like setting up voicemail to email can also be managed online. Follow the steps below to set this up. In the Calling Features tab, scroll down to the Messaging section. Find Voicemail Management and press the Edit button. Email notification: Provides an email notification when there is voicemail waiting. Without attachment: Provides phone number and time stamp. Transfer on '0' to Phone Number: Allows caller that reached your voicemail message to press '0' at any time to reach another number of your choice. Great for transfers back to the main line, your cell phone, another store location, etc. Leave a voicemail message to test your changes. How do I access my SmartVoice group voicemail? Group voicemail is a dedicated line for voicemail that can be accessed from multiple handsets. Did you know? You can set up a group voicemail extension on your handset The group administrator can add group voicemail numbers as a shared call line on any handsets the voicemail will be shared on. For information on how to add extensions to your phone, read How to program SmartVoice handset buttons. Keep reading to find out how to access Group Voicemail. Press the Message Center, then select the group voicemail line. Press the shared call extension on your handset and dial *98 to access and manage the voicemail. Dial in to your group voicemail extension and when you hear the greeting, press * and enter the group voicemail passcode. Dial *98 and then press (star *) while in the menu. Enter the group voicemail passcode. Once in the Group voicemail, choose one of the keypad sequences listed in the next section to listen and manage voicemail. Forgotten Group voicemail passcodes can be reset by the Group administrator of your business. 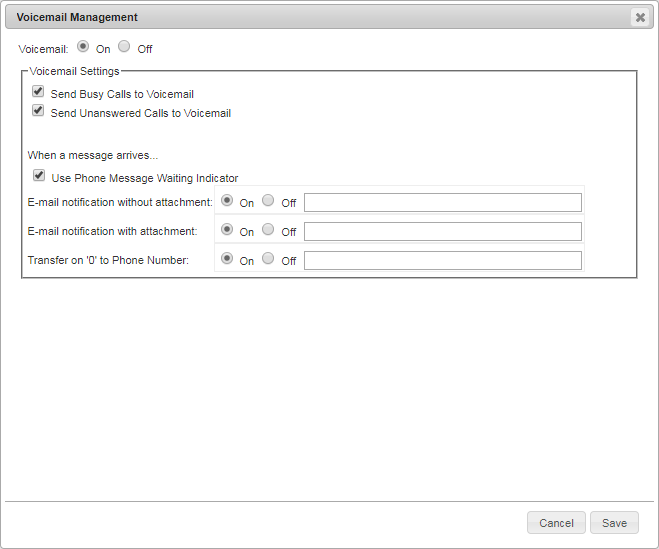 Once logged in to your SmartVoice individual or group voicemail, use this guide to manage your voicemail from your business phone handset. Press the following numbers to access the corresponding option.